sydney — ...and we're off! After a journey spanning two days and a night, East and West, summer and winter, we found ourselves blinking in the Australian sun on the afternoon of Tuesday, January 7. Landing in Australia for the first time is something like waking up in an alternate version of the world you know. The cities and towns look the same, the people look the same, major streets are still lined with giant McDonald’s and KFC signs, but the landscapes, plants, animals and bugs have a fantastical element like it all started in the imagination of a science fiction writer. The rolling hills of Sydney are covered in tall eucalyptus trees called gum trees and large, white cockatoos with tall crests are the region’s answer to New York City’s pigeons. Beautiful, multicolored lorikeets can be seen munching on berries in suburban backyards. Insect life also thrives here like no other place I’ve seen. Militant red ants with mandibles you can see from six feet up stalk hiking trails while a horrifying array of spiders more suited to “The Hobbit” than reality threaten you from any innocent tree branch. That is, if you don’t like spiders almost as big as a dollar bill. During our three weeks in Australia it seemed like there was a new natural wonder around every corner. Our first stop in Australia was Sydney, where Carla has two cousins that she hadn’t seen in over a decade. Her cousin JB immediately took us in from the Sydney airport and, along with his girlfriend Alana, spent the next six days making absolutely certain that we had a good time. After dropping off our bags at his apartment we dove right into Australia’s natural beauty. There is a national park just a half hour drive from JB’s apartment and we went hiking along the craggy coastline and took in some of the most beautiful views you’ll ever find in a major city. That night we kept fighting the jet lag by meeting up with Carla’s other cousin Pia and going out for a group dinner in the curiously named suburb of Crow’s Nest. The love of Carla's life. The next morning JB took the day off work in order to show us around and we spent the first few hours just relaxing on his amazing outdoor deck. His townhouse backs up to a natural reserve that includes a gum tree forest, so the wildlife is especially abundant right out his window. Among the flocks of cockatoos and lorikeets, there is a family of laughing kookaburra birds that comes by his deck for the occasional snack. Magpies hungrily threaten his and Alana’s domestic lovebird and possums can be seen in the trees at night. After brunch we stepped up the wildlife viewing with a trip to Featherdale Wildlife Park. Here you can not only see many of Australia’s most unique and interesting animals but you can interact with them as well. This was a dream come true for Carla. We saw wallabies (including a joey in the pouch), kangaroos, dingoes, a few of the top ten most poisonous snakes in the world, tasmanian devils, and countless birds only found on the Australian continent. Of course a visit to the wildlife park wouldn’t be complete without petting some (surprisingly wooly-feeling) koalas and seeing them drowsily munch on eucalyptus leaves. However, the great highlight of the visit was petting a stubby, chubby one-year old wombat named Bumbles that stole Carla’s heart. “Tears of cuteness” were shed. We spent our remaining time in Sydney exploring the city and enjoying the company of JB, Alana and Pia. For the best views of Sydney Harbor and the Opera House, JB brought us to Manly Beach where we caught the ferry into downtown. 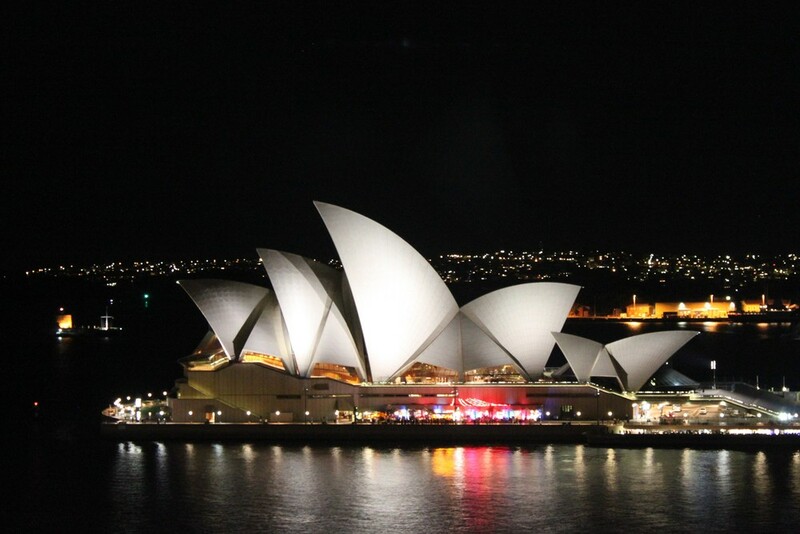 The views from the boat were stunning, particularly when we got close to the Opera House. Sydney’s natural harbor with its many inlets and steep hills on all sides provides a gorgeous backdrop for this sprawling city of 4.6 million. Carla and I spent an afternoon walking around the city center and getting a feel for how Sydney is laid out. Like Los Angeles, Sydney is a large collection of suburban-style neighborhoods with only the small downtown area best viewed on foot. A car is a must in order to properly explore the city. Unlike Los Angeles, gentrification has had its way with the inner city, leaving it somewhat bland and corporate feeling at first glance. The city is beautiful and well-maintained, with perfectly manicured urban parks that would be the envy of just about any city in the world, but it seemed to lack some of the character found in New York’s dive bars or San Francisco’s coffee shops. We did find the architecture interesting, with many houses near the center displaying nicely renovated 19th-century colonial architecture. Sydney’s grungy side can be found in a neighborhood called King’s Cross, where Australians live up to their reputation for heavy drinking, but even here smooth apartment towers loom in the background like chaperones. With sunny weather, clean streets and beautiful scenery, central Sydney is focused on being a very nice place to live for those who can afford it. Panoramic views from the Manly Beach ferry. Speaking of affordability, Sydney rivals Stockholm and London as the most expensive place we’ve been. The rise of the Australian dollar and a 2006-style housing bubble mean a median house in the metro area costs over $700k US. Restaurants cost a good deal more than they would in New York and heavy taxes drive the price of a pint over $10 at most bars. The government’s heavy hand does not stop there. The city’s major freeways are expensive, with tolls of over $20 just to go back and forth to the airport. Speed cameras are commonplace, meaning you don’t have to get pulled over to get fined. Regular hunting rifles are extremely difficult to own. Anything the government thinks you shouldn’t be doing becomes much more expensive—this may have been the first place I’ve seen where a pack of 20 cigarettes costs over $20 US and a six pack of cheap beer over $15. Given the country’s origins as a penal colony and the risk-taking reputation of its people, I was surprised how much larger a role the government plays here than in the United States. After we had spent some time walking around, JB, Alana and Pia met us near the Opera House for a drink. Seeing the Opera House in pictures, I had always thought of it as kind of overrated, like the Statue of Liberty, and only iconic because it was different. Not the case. The building is indeed one of a kind, but its unique architecture inspires awe from both far away and close up. It dominates downtown with its position on a spit of land out in the harbor, and its swooping curves immediately draw the eye from anywhere along the shore. The semi-natural looking shell texture contrasts beautifully with the hard, black lines under the roof. Due to its bending shape and position away from any other buildings it is difficult to measure with the eye from close up, which adds to its mysterious allure. The building is truly a work of art. We were lucky that we had arrived during Sydney Festival and there were a number of special attractions the week we were there. In the shadow of the Opera House, a temporary installation called Exxopolis, Architects of Air was set up. This was a giant maze of rubbery plastic where, when inside, each room was bathed in an intense color filtered through the walls and roof. The five of us went in and were surprised by the otherworldly feel of this place—it’s difficult to describe but we did get some cool pictures. Afterwards we had dinner and drinks at a bar perched above the harbor, then walked across the Sydney Harbor Bridge back to Pia’s apartment. The views from the bridge at night were spectacular, with the Opera House lit up in front of the downtown skyline and the entire city laid out before us. Blue Mountain National Park-- just 70 miles west of Sydney. On our fourth day, JB, Pia and Alana all took the day off in order to show us some real Australian landscapes. We got up early and drove a couple hours west of the city to Blue Mountains National Park. Carla and I were amazed that a national park this beautiful and remote was just 70 miles away from the Sydney metropolis. The road goes up and up into the mountains of New South Wales, where few houses can fit between the slopes and snow can be seen in the winter. Abruptly, the road comes to a cliff edge not unlike Arizona’s Grand Canyon, where a vast green gorge was laid out before us. There is a hiking trail along this cliff edge with breathtaking views throughout—this is how we spent our afternoon. The trail is mostly protected from the sheer drops below, but it is possible to hike down the cliff edge into the valley (sometimes via vertical metal staircases), which inspires the imagination in an uncomfortable way. The landscapes west of Sydney are reminiscent of Northern Arizona or Southern Utah but wet and green instead of dry and brown—I’ve never seen anything quite like it. That evening, exhausted from a day of hiking, JB promised to reward us with a meal of home-cooked schnitzel. We stopped in a quaint mountain town for fresh groceries and wine before going back to Sydney and deliciously undoing any exercise we had that day. Over our last couple days, we went to the iconic Bondi Beach, the much more relaxing Freshwater Beach, an outdoor Chaka Khan concert near downtown (very random) and watched the latest Thor movie on a giant screen in a park (also random). Bondi Beach was especially interesting, mostly because of the people watching. The beach itself is certainly beautiful, but it is so crowded on a sunny day that it can be tough just to find a place to sit on the sand. You are likely to hear more non-Australian accents than Australian ones. Traveling hippies with unruly hair mix with surfer types, European teenagers on a “gap year,” and bodybuilding beach bums to create the most eclectic scene we found in Australia. For a more traditional beach experience, Carla went to Freshwater Beach with JB, Alana and Pia. There they found plenty of open space and decided to do some boogie boarding despite the freezing cold water. It took until our last day in Sydney for Carla to finally have a “proper” beach experience. We learned a lot and saw many beautiful sights over our six days in Sydney, but because of JB, Alana and Pia it was so much more than that. Carla’s cousins took us in like long-lost siblings and spent virtually all their time introducing us to the city and the region. We got to do some very local activities like having an authentic Vietnamese dinner in the immigrant neighborhood and sharing cheese and wine before an outdoor concert. We also got to see some sights like the Blue Mountain trail that we never would have known about. We did everything short of riding in a Holden Ute (a modern day car/truck El Camino) to feel like locals while we were there. Our next stop in Australia would be the remote island of Tasmania, where we would escape the crowds and spend some time on the open road. Making friends with a koala at snacktime.